EWG scientists reviewed Garnier Nutrisse Nourishing Color Creme, Macadamia 90 (2014 formulation) for safety according to the methodology outlined in our Skin Deep Cosmetics Database. We assess the ingredients listed on the labels of personal care products based on data in toxicity and regulatory databases, government and health agency assessments and the open scientific literature. 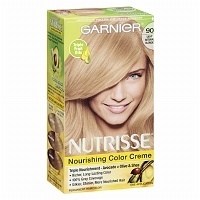 EWG's rating for Garnier Nutrisse Nourishing Color Creme, Macadamia 90 (2014 formulation) is 8. Nutrisse Colorant: Water, Cetearyl Alcohol, Propylene Glycol, Deceth-3, Laureth-12, Ammonium Hydroxide, Oleth-30, Lauric Acid, Hexadimethrine Chloride, Glycol Distearate, Polyquaternium-22, Ethanolamine, Silica Dimethyl Silylate, Ci 77891/Titanium Dioxide, 2,4-Diaminophenoxyethanol Hcl, M-Aminophenol, Ascorbic Acid, Sodium Metabisulfite, Dimethicone, Pentasodium Pentetate, N,N-Bis(2-Hydroxyethyl)-P-Phenylenediamine Sulfate, P-Phenylenediamine, Fragrance, Carbomer, Resorcinol, Vitis Vinifera Seed Oil/Grape Seed Oil. F.I.L. D35230/3Fruit Oil Concentrate: Paraffinum Liquidum (Mineral Oil), Vitis Vinifera Seed Oil (Grape), Fragrance, Tocopherol, Rosmarinus Officinalis (Rosemary) Extract, F.I.L. D25829/5. Rinse-Out Conditioner: Water, Cetearyl Alcohol, Elaeis Guineensis (Palm) Oil, Behentrimonium Chloride, Pyrus Malus (Apple) Fruit Extract, Glycerin, Fragrance, Stearamidopropyl Dimethylamine, Niacinamide, Pyridoxine HCl, Butyrospermum Parkii (Shea Butter), Citric Acid, Olea Europaea (Olive) Fruit Oil, Saccharum Officinarum (Sugar) Cane Extract, Benzyl Alcohol, Chlorhexidine Dihydrochloride, Persea Gratissima (Avocado) Oil, Ribes Nigrum (Black Currant) Seed Oil, Linalool, Citrus Medica Limonum (Lemon) Peel Extract, Yellow 5 (CI 19140), Camellia Sinensis Leaf Extract, Yellow 6 (CI 15985), F.I.L. D35637/3. Nutrisse Developer: Water, Hydrogen Peroxide, Cetearyl Alcohol, Trideceth 2 Carboxamide MEA, Ceteareth-25, Glycerin, Pentasodium Pentetate, Sodium Stannate, Tetrasodium Pyrophosphate, Phosphoric Acid, F.I.L. D12836/26. WarningsImportant: Haircolor can cause an allergic reaction which, in certain rare cases, can be severe. Therefore, you must follow these precautions: do not use if: you have already had a reaction to a haircolor product. You have a sensitive, itchy or damaged scalp. If you have a tattoo, the risks of an allergic reaction may be increased. Perform a skin allergy test 48 hours before each use of this product. Remember to buy your product 2 days ahead of time. Avoid contact of this product with eyes and skin. If product gets into eyes, rinse immediately. Wear gloves provided in kit. Thoroughly rinse hair after application. Do not use over compound henna or progressive color. Wait at least 14 days after bleaching, relaxing or perming before coloring. Keep product out of the reach of children. Do not apply on children. This product contains ingredients which may cause skin irritation on certain individuals and a preliminary test according to accompanying directions should first be made. This product must not be used for dyeing the eyelashes or eyebrows; to do so may cause blindness.